“Clearly this is a big issue in Canterbury. The Crusaders is a well-established name and brand. I think it’s a responsible action to undertake those conversations now,” Robertson told reporters on Tuesday. The nine-time Super Rugby champions — the club competition that features teams from New Zealand, Australia, South Africa, Argentina and Japan — adopted the name 23 years ago. The attacks that took place last week, however, that saw a 28-year-old Australian gunman open fire at two mosques in Christchurch, have put the team’s brand under the spotlight due to the Medieval religious wars between Christians and Muslims. The club continues to adopt imagery from the Crusades at games. 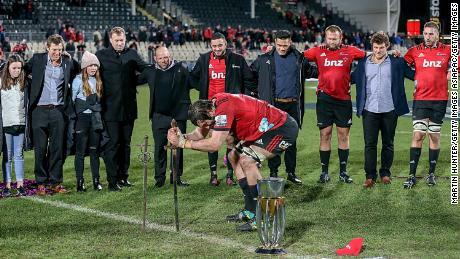 Horsemen dressed in chainmail and carrying swords parade around the pitch, and captain Sam Whitelock plunged a ceremonial sword into the turf after last year’s Super Rugby final victory. “In terms of the Crusaders name, we understand the concerns that have been raised,” CEO Colin Mansbridge said in a statement on the club’s website on Sunday. “For us, the Crusaders name is a reflection of the crusading spirit of this community. What we stand for is the opposite of what happened in Christchurch on Friday; our crusade is one for peace, unity, inclusiveness and community spirit. “Emotions are very raw and real at the moment. There is the need for this community to wrap our support around those who are most affected by Friday’s events, and that is the immediate focus for the Crusaders team. “At an appropriate time, we will thoroughly consider the issues that have been raised and our response to that. That will include conversations with a range of people, including our Muslim community. READ: Could ‘adopted Welshman’ Warren Gatland coach the All Blacks? 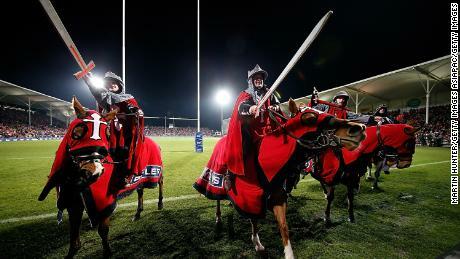 The Crusaders’ game against the Highlanders scheduled for Saturday was canceled. New Zealand rugby star Sonny Bill Williams, the first Muslim to play for the All Blacks, released a tearful tribute to those who lost their lives in the attack and encouraged people to donate to those affected. Mourners in Christchurch paid tributes to victims of the attacks by performing renditions of the haka — the Maori war dance performed by the All Blacks before each game but also used to pay respects at funerals.